Dear Peter, I highly appreciate your hard work and your intentions to help others. After seeing your hard work I was motivated to start collecting art porcelain. I am a retired banker from Pakistan and need your help in selling an antique tea set with the following description. 6 cups, 6 medium plates, 1 large plate , 6 saucers , 1 tea pot, 1 milk pot, 1 sugar pot, 1 bowl, 1 flower pot. One cup has a slight scratch. 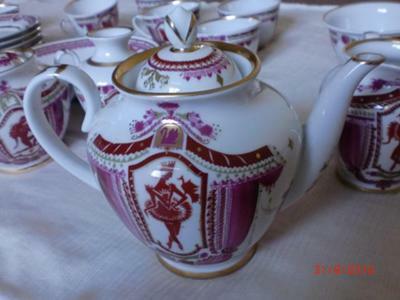 This set is made in USSR by LOMONOSOV, making imperial and highest quality porcelain. It is extremely thin in texture and contain golden work of decorative art of a dancing girl .It is a rare set worth collectible for antique lovers.May be 70 years old. We have other threads already running on Lomonozov. I have written at least one quite lengthy article. Please go to the search box at the top right of the page and put in the keyword "Lomonozov". These photos are a very nice addition, as is your exotic story. I have been trying to find this set on-line to gather in formation on value and history. 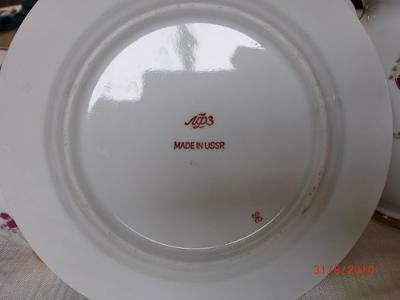 I obtained it in Russia years ago carried in back into the United States. I really would appreciate knowing the value of this set. 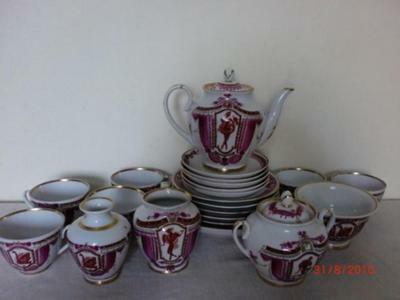 Tea service for six along with condoments dishes, dessert plates and a vase. Please call me at 805-482-2973. Moving and unsure how to sell the set. Thank you for taking the time to reach me. Based on the makers mark on the bottom, the set was made 1972-1986. So definitely not as old as 70-years. But nice set and not very often seen. It is not a flower pot - it is a waste (or slop) bowl. Tea drinkers would pour the hot water that warmed the teapot, tea that had grown cold so they could pour a fresh hot cup and if tea leaves were in the bottom of the cup they could dispose of them before serving the next cup. Return to 6. China Chat - Russian & East European Marks .